Our team is here to rock your ‘walks in technicolor and glitter. and are trained in both traditional and modern techniques. Liza Fishbone is a painter, chalk, and installation artist based in Austin. Through her work, she confronts the intangible nature of Space and Home, and explores the feeling of belonging one place and many places simultaneously. Liza uses the world around her as a canvas, bringing attention to surfaces otherwise overlooked. Growing up surrounded by painters, musicians and storytellers taught her the importance of public art and introduced her to the world of thinking big. From a young age, she learned to paint by climbing alongside her parents as they created murals in St. Louis. Her work is heavily influenced by her time spent in the scenic department of The MUNY Opera, where she became obsessed with paint mixing, the studios of Syracuse University earning a BFA in Fashion Design, and traveling around the world with just a backpack. She often paints with On The Wall Productions. Chelsea is sole proprietor of Chalk Riot, with an insatiable craving to color the world's surfaces. She is inspired by big blank spaces and the potential that they hold to become a canvas for significant art pieces, and wanders the world searching for them. 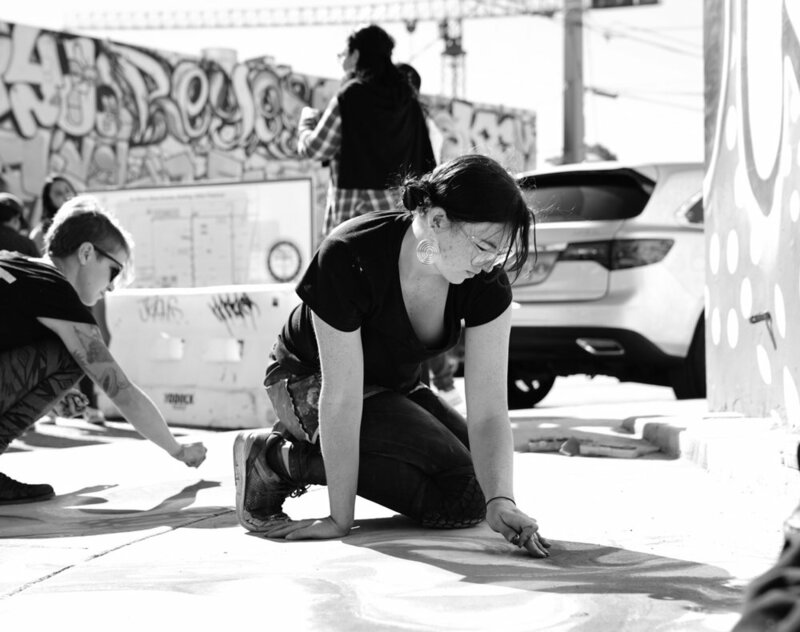 Her chalk art is influenced by traditional renaissance chalk art and modern radical public works.